The Nexus Markerboard Tablet provides writing and drawing space wherever it's needed. 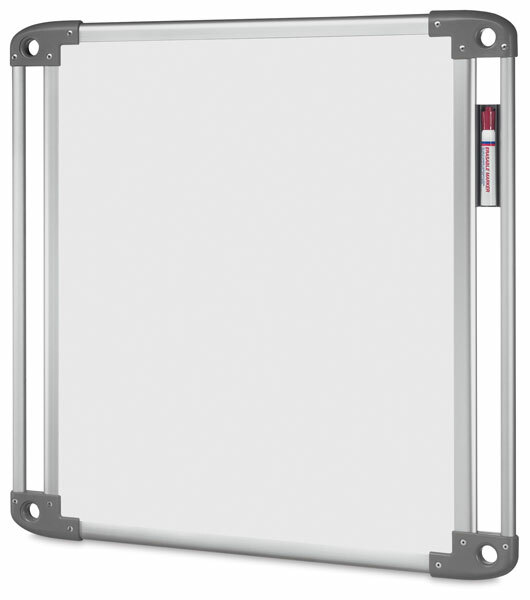 Easy to set up and store, this double-sided dry erase board is perfect for teaching environments, training sessions, meetings, brainstorming sessions, and more. The Nexus Markerboard Tablet is extremely versatile. It can be mounted on the wall with Nexus X-Pegs or used in conjunction with the Nexus Caddy, Easel, or IdeaWall. 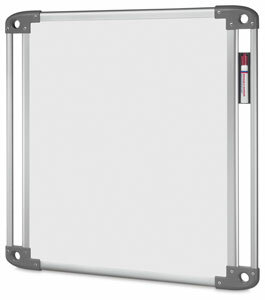 Its user-friendly design includes built-in handles, a lightweight aluminum frame, and a combination holder that offers quick access to your dry erase markers and eraser. Made from high-pressure laminate, the Nexus Markerboard Tablet is free of materials that harm the environment. Plus, it's a reusable, greener, more durable solution than traditional chart pads. The Nexus Markerboard Tablet's writing surface measures 25½"H × 21¾"W (65 cm × 55 cm), a great size for personal use or group interaction. Including the frame, it measures 28"H × 28"W x ¾"D (71 cm × 71 cm × 1.9 cm). It weighs 3 lb (1.4 kg). The Nexus Markerboard Tablet includes a one-year manufacturer's warranty. Nexus X-Pegs — Use X-Pegs to mount your Nexus Markerboard Tablets on the wall. They attach easily with a single fastener, and fit securely into the X-Peg-sized openings on the corners of the Tablets. X-Peg pairs can be mounted in a single row for presenting a line of multiple Tablets, or in multiple rows for upper-level image display and lower-level writing. X-Pegs measure ¾"W × 1"D (1.9 cm × 2.5 cm). They include a one-year manufacturer's warranty. ® Ghent is a registered trademark.™ Nexus is a trademark. Designed to work together, the Nexus product family enables a more collaborative experience for your small group interactions. Starting with the intuitive and ultra-portable Markerboard Tablets, coordinate your thoughts, interact with others, contribute to the discussion, and communicate with the team. Then, connect your Nexus Caddy, Easel, and IdeaWall together to create flexible "we" spaces that enable both formal discussions and larger group presentations.